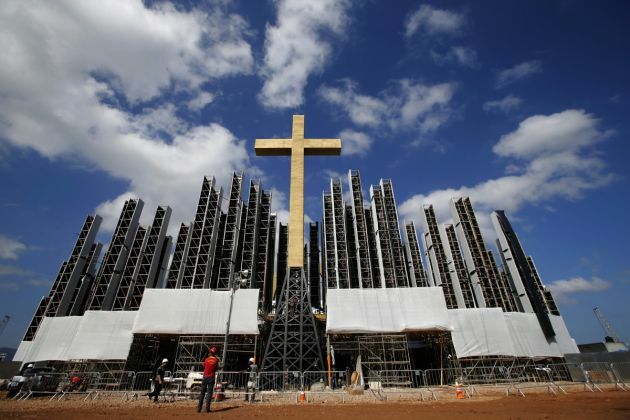 (Photo: REUTERS / Sergio Moraes)The grandstand in preparation for the visit of Pope Francis is seen in Guaratiba neighborhood in Rio de Janeiro July 17, 2013. Pope Francis will travel to Brazil on his first international trip as pontiff in July. The main purpose of the trip is for the pope to preside at the Catholic Church's World Day of Youth. The pope's participation in World Youth Day events starts on the evening of July 25 in Rio's famed Copacabana Beach area and culminates with a huge open-air Mass in the Guaratiba area of the city on July 28. VATICAN CITY (Reuters) - Pope Francis will not use bullet-proof popemobiles on his visit to Brazil to allow him more direct contact with crowds despite the security risks, the Vatican has said. The Argentine Pope, who arrives in Brazil on July 22 for his first trip outside Italy, will use the same open-top jeeps he has preferred to use during his general audiences in St. Peter's Square to enable him to reach out and touch people. "He feels that for him, communicating directly with the people is better that way," Vatican spokesman Father Federico Lombardi told a news briefing. "He decided to do it this way because it is a continuity with the way he does it here." The Vatican has a fleet of bullet-proof, glass-topped, air-conditioned vehicles for use by popes travelling outside Rome. They were introduced after Pope John Paul II was nearly killed on May 13, 1981 when Turkish gunman Mehmet Ali Agca shot him while he was riding in an open jeep in St Peter's Square. Francis will spend a week in Rio de Janeiro to preside over the Catholic Church's World Day of Youth, a gathering sometimes dubbed a "Catholic Woodstock" that occurs in a different city every two years. He will also visit the poor in a favela and meet young prisoners. Francis, who has said he wants to make concern for the poor a hallmark of his papacy, will visit the Manguinhos slum in Rio de Janeiro on the fourth day of his trip to the world's largest Catholic country. The Vatican said he will walk along the streets of the shantytown and enter at least one home before he addresses the entire community in a sports field. On July 24, he will fly by helicopter to the city of Aparecida, about 240 km (150 miles) southwest of Rio de Janeiro, to visit the national shrine of Our Lady of Aparecida, whom the Church honours as the patroness of Brazil. Lombardi said Brazilian president Dilma Rousseff had invited other Latin American presidents to Brazil to pay tribute to the region's first pontiff during the papal trip. The spokesman said he did not know which of them had accepted the invitation. The pope also plans to address Brazil's political and business leaders during his stay. The visit to Brazil is expected to be the only one abroad for the pope this year. The former Cardinal Jorge Bergoglio of Buenos Aires is expected to visit his homeland early next year.